OUR WATER IS UNDER SIEGE! Years ago when I was in Spain, we were advised to drink bottled water as opposed to tap water. To my surprise, we found that wine was actually cheaper than water. I mention this because as you read through this issue of the Messenger, we in California, may soon discover that alcoholic beverages might be more available and cheaper than water. This is why it is so important that we all become informed and involved voters in the 2018 election campaigns. Read the ballot initiatives and find out who is backing them. The same with candidates, their positions and polices on issues such as Yes on Prop 6, repeal of the Gas Tax, Sanctuary State Policy, forest management and water. Remember, the main origin of water for California lies within the counties of Jefferson. Dams proposed for removal are located in the Jefferson counties of California and Oregon. In the meantime, we still live in California, but the outcome of this years election is not just about California. It is about going on record, taking a stand and fighting for the future of the new State of Jefferson and our Nation overall. Earlier this month, the State Water Resources Control Board (SWRCB) proposed dedicating much more river water to the environment and less to farms, industry and individuals according to CAL Matters. SWRCB wants to divert water from the Stanislaus, Tuolumne and Merced Rivers to save fish. SWRCB was appointed by Governor Jerry Brown, who has been working on the Bay Delta Plan since 2009, before he took office. However last week, the U.S. Department of the Interior sent a letter to SWRCB recommending that the Board reconsider the Board Amendments and “postpone the public meeting currently being scheduled for August 21-22, 2018, for additional due diligence and dialogue.” It is believed that Congressman Tom McClintock and Calaveras County Supervisor Dennis Miller are greatly responsible for this recommendation by the U.S. Bureau of Reclamation. Miller had also sent a letter to President Trump. Should the SWRCB go ahead with their Amendments, the San Francisco and other Bay Area cities that depend on water from Hetch Hetchy Reservoir may find that they need to cut use. Any decrease in Northern California supply will ripple to Southern California. Farmers expect “devastating impacts,” reported the Modesto Bee. 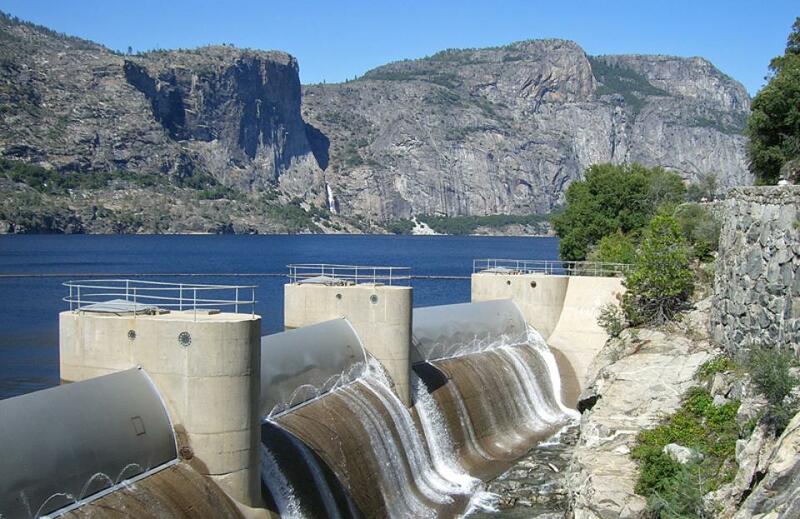 At the same time the aforementioned was being reviewed, the Restore Hetch Hetchy group filed another lawsuit looking to drain the reservoir, the source of water for about 2.4 million bay area communities, including San Francisco. However, in June, a Tuolumne County Judge threw the case out of court. Last month, blue prints were being reviewed for the removal of the four Klamath River dams owned by Pacific Corp, which has determined that dam removal is the best economic decision for the corporation and its ratepayers. It is reported that this will be the largest dam removal project in U.S. history and will be required to jump through several regulatory hoops and agencies at both the federal and state level. Two of the dams are located in southern Oregon and the other two in Siskiyou County. The estimated cost for the project is $450 million to complete with Pacific Corp ratepayers in California and Oregon contributing $200 million. The state of California is contributing the other $250 million through the $7.12 billion Proposition 1 water bond passed by voters in 2014. Now there is another water bond on the November ballot. Proposition 3 would issue $8.77 billion in general obligation bonds for water-related infrastructure and environmental projects. The state fiscal analyst said the bond would generate about $8.4 billion in interest over a 40-year period, meaning the bond would cost the state (taxpayers) a total of $17.3 billion. The 2.7 billion dollars that was earmarked for water storage facilities in the aforementioned 2014 Prop 1 water bond, was finally allocated about a week, ago. Some speculate that this $2.7 billion was finally spent because voters may not take too kindly to the passage of another water bond in November. Of the Prop 1 bond money, $816 million went to fund the proposed Sites Reservoir in Colusa County, a drop in the bucket, for the estimated $5.2 billion dollar project. Reportedly, Sites is necessary for Jerry Brown's Delta Tunnels. Brown supports Sites Reservoir, which is located in the backyard of his family's ranch. Last year, some questioned why Prop 1 money was not used to repair the Oroville Dam spillway. State officials told them that Oroville and other existing state water projects were not eligible for Prop 1 Money. Yet, Prop 1 money can be used to remove the four Klamath Dams. As far as Prop 3, the largest amount of bond revenue - $2.895 billion would go toward conservancies and state parks to restore and protect watershed lands and non-profits and local agencies for river parkways. Only $472 million is allocated for water storage facilities/dam repairs, another drop in the bucket. The author of Prop 3 is Gerald (Jerry) Meral, Jerry Brown's former Guru with the California Natural Resources Agency. Meral has a long history of being a major mover and shaker in the environmental community, and one of the original organizers of Friends of the River, who led the charge to stop the construction of the New Melones Dam located on the Stanislaus River. Meral and Friends of the River lost their battle on the Stanislaus however, still today, their cry of, “We Will Never Forget the Stansislaus”, echoes through their annual conference. Years later, Friends were successful in preventing the construction of the Auburn Dam. Nearly 60 years ago, Governor Pat Brown persuaded voters and legislators to approve one of the nations largest public water projects, the State Water Plan, that included a “peripheral canal”, a massive aqueduct to carry water southward to San Joaquin Valley farms and Southern California cities. The peripheral canal never got off the drawing board. Fast forward to today with a new version of the peripheral canal – twin tunnels to carry water beneath the Delta – emerged. Jerry Brown adopted the tunnels, now dubbed WaterFix. So how does Jerry Brown and the Department of Water Resources intend to pay part of the $17 billion twin-tunnel project? Remember in 1960, voters approved the State Water Plan. In 1978 Prop 13 was approved, due to the outrage over voters' skyrocketing property taxes, thus taking control away from the Legislature. However, Prop 13 allowed for the tax rate to be higher than 1 percent if needed to pay for debt that voters had approved in prior years. Today, there's still an extra charge for the State Water Project on your property tax bills. Right now, the teams in the greater bureaucracy are wrestling with how to make the proposed WaterFix project go back in time to 1960. Thinking that since voters already approved the debt for building the twin tunnels, property taxes can be raised if needed to pay the WaterFix debt. Reportedly, to do this, they're redefining the WaterFix as part of the State Water Project. Under state law, Water Code 147.5, the Department of Water Resources can finalize a long-term water contract 60 days after the Joint Legislature Budget Committee holds an informal hearing. The committee doesn't have to vote. The Legislature doesn't have to vote. All that's needed is the hearing. The hearing has been scheduled for August 14, 2018. Sixty days later, the new long-term hearing will be finalized extending the term through 2085 and setting the stage for WaterFix debt to be issued. Jerry Brown's Choo Choo Train may not be realized but his WaterFix could well be, shortly before the end of his term. California's man-made drought will become permanent in 2022, due to Senate Bill 606 and Assembly Bill 1668, signed by Governor Brown in May. Establishing an indoor, per person water use goal of 55 gallons per day until 2025; 52.5 gallons from 2025 to 2030; and, 50 gallons beginning in 2030. Creating water incentives for water suppliers to recycle water. In other words, you may be fined if you take a shower and do a load of laundry the same day. An 8 minute shower uses about 17 gallons of water and a load of laundry about 40 gallons of water. Just when you go to grab a glass of water, you could find the water police knocking on your door. According to the Pacific Research Institute (PRI), New Permanent and Water Restrictions WON'T increase water supply. So what do we do? Do we sit on our hands and remain silent and let this all happen? Do we move to another state only to find that when it comes to California's environmental policies, they often spread to other states. Look at what has happened with emission standards. California led the charge! We who populate the Jefferson Counties must use every opportunity to stand up and speak up about what is about to befall on all in California. This affects your families industries and agriculture. It is predicted that farmers will have to jump through hoops and create water management plans by those in government. What about you who have swimming pools, hot tubs and fountains? Will you be able to plant your vegetable garden? Do you think there might be food shortages, driving food costs even higher? Our fight begins today, not tomorrow. It is our responsibility to educate and join with others to Repeal the Gas Tax, to Get Out The Vote in November. We must expand our efforts to raise funds for our court case, because nothing will be fixed or changed until “we have equal representation” for all in California. And, last but not least, talk about the new State of Jefferson with NO State Water Resources Control Board, NO CEQA (California Environmental Quality Act), NO Fire Tax, NO Office of Planning & Research, that dictates land use, and NO CARB. This is called LIBERTY! 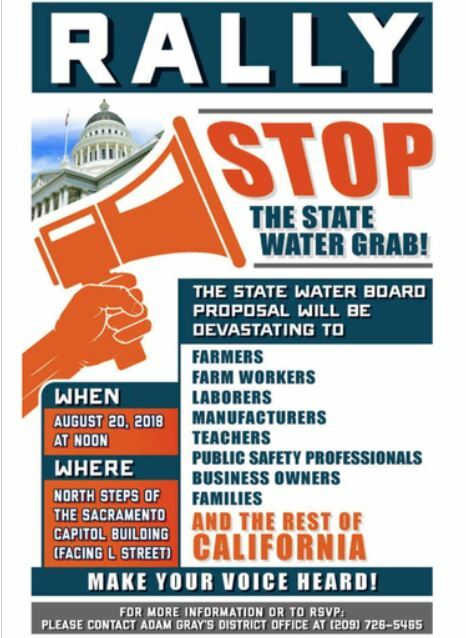 Mark Your Calendars – As far as the SWRCB Delta Plan, Stop the Water Grab Rally is scheduled for noon on Monday, August 20, 2018, on the north steps of the State Capitol. We ask that Jeffersonian's join legislators, elected county & city representatives and water purveyors who will be attending and speaking at this very important protest rally, organized by Assemblyman Adam Gray. Car pools are being coordinated in many of the Jefferson counties. Wear your gear and bring signs identifying your county and Jefferson. Our hearts go out to the fire victims as these devastating fires keep burning in so many of our Jefferson Counties. So many of you have reached out wanting to take food, clothing and even offer shelter to assist those who have suffered so many losses. Right now, what is needed most is money. Visit the county community organizations and their web sites that are assisting fire victims: The Carr Fire – Shasta Regional Community Foundation, for both Shasta & Trinity Counties. Ferguson Fire – Mariposa Community Foundation. Mendocino Complex Fire – Disaster Fund for Mendocino County. Congressman Tom McClintock will be the guest on the State of Jefferson Hour broadcast on KAHI Radio, 950 AM and 104.5 FM, this Sunday, August 12, from 10 to 11am. This weeks co-hosts are Paul Gallo, SOJ Placer County and Jack Parsons, SOJ El Dorado County. The Congressman sits on the House Natural Resources Committee and is spending the month of August attending meetings and events throughout California's 4th Congressional District. If you are not in KAHI's broadcast range, you can go the KAHI website and listen in on your computer. State of Jefferson Hour is a live talk show with callers welcome. To call in, dial 530-885-3565. Also, airing every Sunday from 9 to 10 am, is Jefferson State of Mine on KCNR Radio, 1460 AM. Co-hosts Terry Rapoza and Win Carpenter will be talking about what they define as “The Silver Bullet” - It's All About Representation. The call in number is 530-605-4567. Both Jefferson radio shows are the best sources to hear all the latest updates about the court case and what is happening in Jefferson. Mark Baird is a regular guest, and more recently special guests include Mark Meuser, candidate for Secretary of State, Judge Steve Bailey, candidate for Attorney General and Ben Bergquan, spokesperson for Fight Sanctuary State. Another new radio podcast has been added in Stanislaus County and can be heard by going to https://jeffersonlibertyradio.com/.